Have you ever designed a medical device that has electrical components? Was it frustrating to go through the electrical safety testing - the IEC 60601 standards? Claus Roemer Andersen, a compliance expert from Roemer Consulting, shares his experiences and advises us on how to design for compliance with IEC 60601. After all, a lack of electrical compatibility can be detrimental to medical devices and the patients who use them. IEC 60601 documentation is a lot to digest, which is a major challenge. But that does not mean you should neglect those standards. Applying the standards and making changes early on adds value and saves your company a lot of money. Road to Compliance: Design specific technical requirements during the early phases of product development, and perform design reviews and pre-testing. How to integrate design input requirements from a risk-management perspective. Why IEC 60601 standards are difficult for most people to navigate. IEC 60601 has 8 specific things you have to address in your risk-management process, but they don’t fit into or make sense in a typical risk analysis table. The reason why the FMEA tool is not a useful tool regarding electrical safety: It is a single-fault failure, which is not sufficient. Understand who will be using a product and in what kind of environments because that shapes what you need to do regarding electrical safety. If you don’t follow standards, you face expensive and time-consuming redesign or you have to defend the effectiveness of your risk analysis. The days of “I Promise” statements for electrical safety are gone, and they make for delays and redesign challenges. Recorded Intro: Welcome to the Global Medical Device Podcast. Where today's brightest minds in the medical device industry go to get their most useful and actionable insider knowledge, direct from some of the world's leading medical device experts and companies. Jon: Oh my goodness have you ever designed a medical device that has electrical components, printed circuit boards, things of that nature? And if you have, how frustrating was it to go through the electrical safety testing, the IEC 60601 standards. 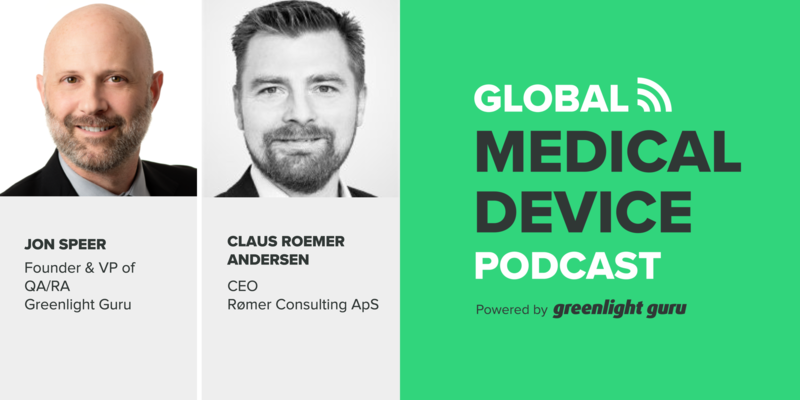 Oh my goodness, I've got horror stories that I can share with you and in fact I do share at least one of those stories on this episode of the Global Medical Device Podcast where I speak with Claus Rømer Andersen, from Rømer Consulting, an expert for compliance with IEC 60601. 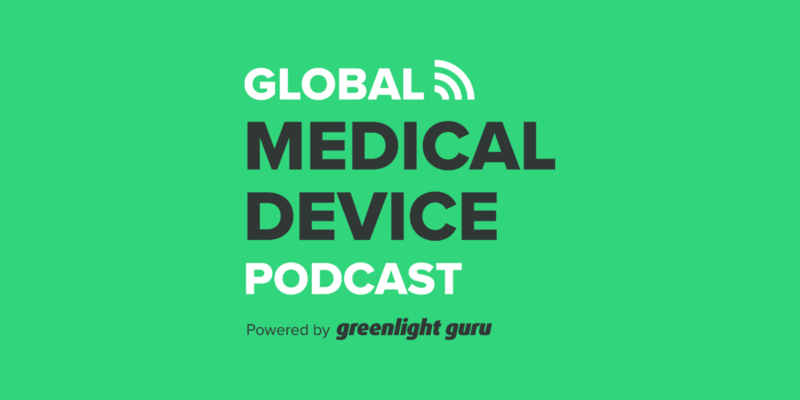 So if you have a medical device that involves electrical components in some way, shape, or form, you're gonna wanna listen to the advice that Claus offers on this episode of the Global Medical Device Podcast. Jon: Hello and welcome to this episode of the Global Medical Device Podcast. As always, this is your host, the founder and VP of Quality and Regulatory at Greenlight Guru, Jon Speer. And folks today, well let's just be real. Companies in the medical device space, there's lots of challenges that we're faced with. And if you're developing an electromechanical device, there's a big challenge that we have to deal with, and it has to deal with the topic of electrical safety of that medical device. Jon: And there are some super complicated standards that are out there, and the lay person, or even a knowledgeable person for that matter, is gonna struggle to understand how and what and when to do certain activities to be able to demonstrate and prove that your device is safe and effective and meets the intent of these electrical standards. Jon: Well the good news is, we're gonna dive into that topic, how to design for compliance with IEC 60601 and I have an expert on the phone today, Claus Rømer Andersen. Claus, welcome to the Global Medical Device Podcast. Claus: Thank you so much. Jon: Alright so tell us all a little bit about what you do and how you can help companies understand a little bit about this. And of course we're gonna dive into, we're gonna have a discussion today about some of the nuances and some of the specifics and provide some tips and pointers. But give us a little bit of a high level overview of Rømer Consultants. Claus: Yeah, thank you so much. I'm an independent consultant working within the fields of EMC, radio and safety. So basically I help manufacturers of medical devices navigate the technical and regulatory requirements related to EMC, radio and safety. So I review the science, documentation, the form analysis, and write up test plans all to help document compliance with the requirements for EMC and safety. Jon: Very good. Let me start off if it's okay with you, let me share a story about an experience that I had, and this goes back quite a few years. We were designing an electromechanical device, it was a pump product. And we were doing some work with a startup and we were trying to get the first few units of the device ready, tested, proven, we were preparing for a 510(k) submission here in the U.S. And one of the big parts of a 510(k) involves electrical safety. You have to go through generally the IEC 60601 testing that applies to your particular product. Jon: And so we had done a lot of testing, a lot of performance testing on the product to make sure that it works, and I'll just say we probably started our IEC efforts later in the process than we should have, and that became evident only after the fact that we would get into, we had kind of a test facility that we were doing some pretesting, or prescreening if you will, and every time we zapped the device with volts from an EMC standpoint, we killed the product, and we'd have to go back and rework the board and that sort of thing. It was a very frustrating experience. I'm sure this is not the first time you've heard a story like that. Claus: Certainly not. And maybe you were lucky that you killed the product. I've seen products like infusion pumps giving the wrong dosage to a lack of EMC, so a lack of electromagnetic compatibility, especially when it comes to RF immunity from sources like mobile phones and things like that. So it can be quite a challenge to design a product to work adequately and properly and be safe and effective in the intended use environment. And EMC and safety, they are complex matters and as you allude to, a lot of companies don't take the requirements into account in the early phases of development. And then you face a lot of challenges down the road when it comes to type testing your product. Jon: Claus, I want to get some tips and pointers from you that we can share with the audience of the Global Medical Device Podcast of what can I do, what could I have done differently to better address that earlier rather than later? So I don't know if you have maybe a couple of tips that you can share first and then we can dive into some of the nuances and the details, for sure. Claus: Sure. Basically the tips are to design specific technical requirements during your design input phase before you actually design the phase so evaluate the requirements that are relevant to your product and to your intended use environment and write them down in the early phases of product development and include EMC and safety in those specifications. Write test plans when you do a requirement specification to ensure that you consider how you're going to actually test it in the end. Otherwise, quite often it's too high a level, or it's addressed at a too high of level, so it's not specific enough to take into account. And then perform design reviews integrated with your risk management process at suitable intervals and pretest as soon as you can. So as soon as you have that first circuit board, begin testing not only for functionality, but also for safety and for EMC. That's the road to compliance. Jon: Well I like your advice, and folks the device that Claus is providing about, defining your design inputs to be thorough, complete, comprehensive, clear objective, but the key thing that he mentioned from an electromagnetic perspective and electrical safety perspective is to consider how you're going to verify that while you're defining the design input. And that's good advice for every single design input, not just the electrical safety items. Jon: But you have to think about that and I wanna pull on a couple threads that you just shared, and I want to go back to the tidbit that you offered about the infusion pump where you tested it, it failed, and it delivered the wrong dose. You just mentioned risk, you have to evaluate the risk, you have to identify the risk. In that scenario, that's a high risk issue that you need to know about as soon as possible. And so maybe you can talk a little bit about how to kinda integrate, if you will, your design input requirements and as you start to think about how you're going to test and verify and all those sorts of things, how do you do that from a risk management perspective? Claus: Well first of all you have to consider all the relevant aspects of EMC. And typically that's neglected due to a lack of expertise with design manufacturers or manufacturers of medical devices. And also the risk management standard 14971, it's sort of weak when it comes to EMC and safety. The requirements are there but not at the sufficient level of detail. So diving into the standards, actually the standards for EMC and safety, the 60601 series is a great tool. However, they are not written from a design perspective. So they can be quite a mouthful for a lot of people to navigate. And therefore these requirements are neglected typically in the early phases of product development and only to discover your challenges down the road once you come to a final testing. Claus: So basically you have to consider also that these issues are not easy to deal with in a typical risk analysis format. The typical FMEA table, FMECA table, doesn't suit these purposes of taking into consideration your end use environment, the EMC phenomena that are relevant for your device test levels, acceptance criteria. Basically the standard for EMC, it has eight specific themes you have to address in your risk management process. And they don't really fit into a typical risk analysis table, so we have to find another way around to make it make sense in the end. Jon: And that's a really good point when you talk about FMEA, it's a tool that a lot of people use from a risk standpoint and when you talk about electrical safety, at least in my experience, FMEA kind of breaks down, it's not a useful tool and here are a couple of reasons why, from my experience. FMEA is a single fault failure, and that means that there is a single issue that creates the failure mode that manifests as some sort of event or some sort of effect. And while there are cases from an electrical safety standpoint, where you may have a single fault failure, my experience says that there's usually a chain of events that occur. This event happens that leads to this event, that leads to this event, and then the issue or the hazardous situation will manifest, and so the issue or the hazardous situation were manifest. So this is sort of the big difference between and FMEA approach versus a more holistic approach from the ISO 14971 standpoint. So I wanted to clarify that. Claus: Can I elaborate on that? Because typically, I've seen a lot of risk analysis and especially around EMC and safety, and most of them, they tend to address electrical safety in one line or have one hazard addressing all of electrical safety. And then it refers to compliance with 60601-1, the general safety standard to mitigate. In the old days, maybe that was sufficient, but those days have passed and it's just not adequate to have one line addressing safety and one line addressing electromagnetic compatibility. And you have to elaborate and go into more detail. Jon: Yeah. And I think this really emphasizes the importance of understanding your intended use of the product, your indications for use. And this really emphasizes capturing good user needs to understand who the patient is, who the user is, what's the environment that the product will be used in or the environments that the product will be used in. Jon: And I shared, Claus, at the beginning an example of a project that I worked on a few years back. It was a pump device for wound therapy and the intent was for this product to be used in the home environment. I know that creates a whole new set of circumstances that maybe we'll dive into here in a moment. But as we started to test for that environment and we started to communicate with the FDA, there were some really interesting questions that were being asked, some really good questions that, frankly, we had done a poor job of considering. And one of those questions was, what about ambulatory? What happens if that person that's using this device in the home environment needs to be transported to the hospital for some reason via ambulance? There are a whole new set of circumstances and environment and interferences and interfaces and all these sorts of things that now come into play. So you really have to be thorough in defining all of those things and understanding that, because it really shapes what it is that you need to do from an electrical safety standpoint. Claus: Certainly. And you can also include the expected lifetime of the device into that consideration. The infusion pump I mentioned, I actually tested that for a hospital, so it was an existing [inaudible 00:15:03] on the market. An old device, maybe it was developed 30 years ago, and back then the manufacturer didn't consider that over the years the density of mobile phones and wifi/Bluetooth devices is going to increase to the extent is has, and therefore immunity to interference from these sources of electromagnetic fields just wasn't addressed adequately in the design. And that's why you could cause the malfunction of the device. Claus: And that's a challenge because how are we going to foresee what technologies are going to emerge in all relevant use environments down the road as time goes by? Because a lot of medical devices, they have a long life span. They're expensive to buy and they need to work a long time. So you have to consider that also. Jon: For sure. Now you talked about the scenario you've seen where sometimes there's one line to say be safe, and that sort of thing and not really cutting it. But, confess, it's been a day or two since I've read IEC 60601, but my recollection of the last time that I read it, it's hundreds of pages in length. And I'm an experienced product development engineer. How in the world can I digest that standard? Claus: Yeah. That's one challenge. I'm looking at the dash one, the general safety standard right now as we speak, and it's 420 pages, and the ECM standard is 192 pages. So it's a lot to digest as a developer and EMC and safety may not be your area of expertise. And you have to take care of functionality and all the other important aspects as well. So that is a major challenge. Claus: But that doesn't mean that you should neglect to address it in the early days of development, as a lot of companies do, and focus on what they understand. It means you have to be really, really careful, and it can be quite simple. For safety, for example, writing up an isolation diagram is quite simple if done early. If it's done too late, you just end up identifying where you don't have sufficient isolation or things like that, and why you won't meet the standard. And then either you face expensive and time-consuming redesign, or you have to argue through your risk analysis that it's still okay somehow, even if you don't meet all the requirements of the standard. Claus: So, doing it early is one point, even though it's a big challenge and it's a lot of pages to consider. And if you don't want to do it yourself, there's people like me who can help you out. That's why we're here. Jon: Exactly. And folks, to continue the story that I've shared with Claus today, let's just say we considered the requirements of IEC 60601 very late in the process. Essentially, we were at what we thought was the design verification stage. We had gone through a lot of the other aspects of defining user needs and inputs and outputs, and we were, what we thought at least at the time, weeks away from preparing our 510K submission. And then we did our pretesting, which, yeah, of course it was way too late in the process, but, when we did that, we had already purchased the injection mold components for the enclosure, we had already ordered printed circuit boards, basically we had what we thought was a complete device. Jon: And when we started doing the testing, we realized we had to wrap the board and capped on tape in certain places and we had to spray the interior of the mechanical enclosure with a nickel paint. So, really, we had to do a lot of hacks to this device that were, frankly, they were afterthoughts. And in hindsight, yeah, it would have been much better for us to have digested the four hundred and some pages in one standard and the hundred and some in the other, or called a guy like Claus to help us identify that. Claus: Yeah. And also because the new versions of the standards for safety and EMC, like risk management and quality management, the new versions are process standards, to an extent. So they actually require that you do risk management. I know you know that. But you have to start early doing that. It doesn't add value if you do it too late in the game. So doing it during verification only just doesn't make sense. Whereas, doing this analysis proactively and early actually adds value. Claus: In my experience, what you're describing is scaringly normal. It's typical, although it's not in compliance with the current versions of the standards. And it's not best practice in the industry. But it's what's normal these days, still. But actually going through the process, doing that analysis even if it's a little bit painful, it adds value. You gain that deeper understanding of your product. You can mitigate a lot of things early on quite simply. So it's simple and effective to do it early on, whereas it's time-consuming and expensive to do it late in the game. Jon: Oh, for sure. And this story that I'm referring to, we had to make some design modifications. And again we were, what we thought, fairly late in the process. And there's this "rule" that a lot of people apply, the 1/10/100/1000 rule that, basically if you make a change to something while it's very early, it theoretically costs you a dollar, whereas the later and later you get, it's exponential cost increases. So if you're at a very late stage and you have to make a design change, and some cases you may have to retool your product in a way, you may have to build new boards and that sort of thing, and update schematics so it gets to be very expensive. So finding out early is important. Jon: The other thing that it can do is it can delay your submission. It used to be in the FDA world that when it came time to submit a 510K, you used to be able to provide what was in the industry somewhat known as a "I promise" statement. In the "I promise" statement maybe be that, oh, we're going to do this testing but we don't have it completed at time of submission. And folks, I want you to understand, those days of providing "I promise" statements for things like electrical safety, for things like sterilization, for things like biocompatibility, those days are gone. Jon: I encourage you to do not submit your 510K without having completed electrical safety, without having completed sterilization and biocompatibility. And there are others, too. But certainly, you need to have the proof, the evidence that this product is safe and meets the IEC 60601 series of standards that apply to your product. You need to have that completed and done at the time of your submission. Otherwise, it's going to get kicked back. It's going to get rejected. And that also causes delays. Claus: Yeah. And not only because the FDA are going to ask for it, but also because if you don't have it in place when you submit, you're going to face design challenges. The statistics on the subject, they're quite weak, as there's not publicly available information, but some big test firms have done analysis and the failure rate, the first time you submit a device for testing, is in the neighborhood of 50 to 80%. So 50 to 80% of devices fail testing the first time around. And going through redesign, producing new devices, generating new documentation, getting a new time slot at the test lab, that means you have a turnaround time of about six months, or so, at least normally. It's a big issue for many companies. Jon: All right folks, I just want to remind you all, I'm talking with Claus Roemer-Anderson from Roemer Consulting, and we're talking about how to design for compliance with IEC 60601. A lot of the things we're talking about today are definitely design control risk management related. Things that you need to be capturing, and documenting, and testing during the design and development process for your medical device. I want you to know that Greenlight Guru, we have a software platform designed specifically for the medical device industry to help you manage your entire quality management system. And within our platform, there are specific workflows that help you manage, maintain, document, collaborate, communicate your design controls, your risk management. And we've integrated risk management using an ISO 14971 approach. We've integrated that with your design control activities, so that these are seamless with one another. Jon: Which, our customers are telling us, as they're preparing for the 60601 testing, risk management is a key critical must-have component, as part of that testing. The fact that they're able to leverage the documentation, and the evidence that they are maintaining within their Greenlight system is making that process quite a bit smoother. Claus, let's dive into this pre-test, because I know how invaluable that is and how important that is. When I do this again, and when I work on a product again that's going to have electrical components to it, that I need to demonstrate that safety, my desire is to do some pre-testing to demonstrate electrical safety, as early as I can, in the design development process. Jon: I want to do it while I'm defining user fees. I want to do it while I'm defining design inputs. How do I do that? I mean, because I may have to have plastic components. I may have to have printed circuit boards. I may have to have some firmware. I may have to have a lot of the design somewhat complete. These seem to compete with one another. How do I do that effectively? Claus: By having a good work breakdown structure or your product and also, today, a lot of device designs, or system designs, they're based on a modular approach. What I mean by that is today when you design and develop a product, quite often you integrate already existing modules from different suppliers into one final product or one final system. Specifying requirements at the modular level for safety, for EMC, enables you to translate the system level requirements to a module level. Then you can pass those requirements onto your suppliers. You can ask them for documentation, if they have existing documentation that demonstrates sufficiently that they are in compliance with your requirements. And, if not, you can test at the module component level. Claus: A lot of parameters that you can actually test, in a meaningful way, on a module, or circuit board, or component in the early phases before you have your first working prototype. It just adds invaluable knowledge and experience to your project, doing so. Jon: Yeah. This is just practical, pragmatic engineering. Folks, I mean, I can imagine. We talked about these standards and how important they are. I know a lot of you out there are saying, "Yeah, but I'm not an electrical expert," and "Yeah, I can read the standard and I may not know what it is that's being described at a particular clause," and that sort of thing. But, at the same time, I think it is important for you to empower yourself, gain that knowledge, and lean on the experts. This is what Claus does for a living. He is an expert in this space. It's always good to think about that sooner, rather than later. Jon: Claus, just before we wrap up our conversation, and I know we're just skimming the surface on this topic. We're just giving some practical advice to folks. And we're certainly going to share how people can get a hold of you, before we wrap up today. But before we do so, what are some key piece of advice that you think would be important for our listeners that we haven't covered yet? Claus: Actually, what you just mentioned about realizing if you have sufficient expertise or not. That's a strategic choice to have it in-house or not and use external consultants, such as me. That's really an important choice to make early on. Are you going to read the center and go through all the pains of that? It's doable, but make an informed choice of doing it or not doing it. Then address it in your project plan. So onboard external consultants, test houses, as necessary, if that's your choice. If your choice is to use internal expertise, then make sure to evaluate that expertise you have available and upgrade it, if necessary. If it's not an active choice, then these quite important areas for design tend to be neglected. Claus: Then make a good requirement specification, write test plans early, design reviews, taking into account safety, EMC, and pre-test. That's its essence plus that. That's the road to compliance. Jon: Road to compliance. I'll leave you with this, folks. If the only reason that you're interested in 60601 and other electrical safety testing and standards is because you feel like you have to, and you feel like you have to check a box on the form, you miss the point. I mean, we're in a world today ... Think about all the electronic devices that you have. My phone, as soon as I get in my car, it connects to my car, sometimes whether I want it to, or not. I have a computer and all sorts of gadgets. I have a smart TV, just think about all the things we have in our homes. And how sometimes things don't function the way they should, or there seems to be something that creates some sort of interference, or unintended consequences. Jon: Imagine that same scenario at a hospital setting, where a patient is in the ICU, and they have all sorts of equipment, life sustaining, life supporting equipment that is connected to them to keep them alive. Imagine your device is going to go into that environment. Is your device going to add problems to an already complicated situation or is it going to function as you expect? And this the whole essence of why we do what we do as medical device professionals. We want to be focused, not so much on compliance, not just because we have to something, but we want to elevate our thinking to the next level. We want to think about true quality and making sure that we are improving the quality of life. Claus: Certainly, move away from the necessary evil mindsets and towards the proactive design for compliance mindset. Jon: Absolutely. Claus, I want to thank you so much for joining me on the Global Medical Device Podcast. Folks, you should reach out and learn a little bit more about Roemer Consulting. You can find more on the internet at www., R-O-E-M-E-R, consulting.dk, Roemer Consulting, all one word. You can contact Claus directly via email at Claus, C-L-A-U-S, at roemerconsulting.dk. Claus: Certainly, and I'm on LinkedIn, as well. Jon: And he's on LinkedIn, so Claus Roemer-Anderson, folks. You have been listening to the Global Medical Device Podcast.